AKA your complete guide to cooking corned beef haha! I love corned beef, and I have no idea why I don’t eat it more than once or twice a year. Holidays are food blogger heaven. With St. Patrick’s Day coming up, as obvious as the choice may be, I wanted to share a really great Corned Beef & Cabbage recipe. Last year I shared a traditional recipe for Corned Beef & Boiled Cabbage. It’s simple, straightforward, and really easy to make - not to mention wonderfully comforting. Traditional corned beef is often served with boiled cabbage, potatoes, and carrots. Although they’re yummy, this year, I wanted to step it up a little bit and play with different cooking techniques. I decided to roast the veggies and absolutely loved how they turned out. The cabbage had more substance, tasted fresher, and had great texture. Roasted carrots are tossed in olive oil, salt, pepper, and balsamic vinegar, making them wonderfully sweet and glossy. A twist on serving boiled potatoes is simply smashing them up with some butter and parsley. These simple changes help make this cliché meal a little more special. Corned beef is a preparation in which a cut of beef, which is traditionally brisket, is cured in a brine solution along with various seasonings, and then slowly simmered until it’s fall-apart tender. It can also be made from beef round. Last year, I used a point-cut brisket. There is also flat-cut, and of course, beef round. Costco had some great beef round on sale, so I decided to give it a try. After 4 ½ hours, I was exhausted and upset to find that the beef round that I simmered in ginger ale and smothered in honey-mustard was not nearly as tender as corned beef should ever be, and not even close to as mouthwatering as it was when I made it last year. I was torn about whether I should just scrap the entire idea, or dare to cook it all over again the next day. I decided to hit Safeway again and give it another try. I decided to try 2 different brands of point-cut brisket - Shenson Brand Point Cut Corned Beef Brisket and Safeway Brand Point Cut Corned Beef Brisket. Last year I used Shenson brand, and absolutely loved it. Tender, flavorful, and easy to cook. But I realize that not every grocery store may have this brand of corned beef brisket, so I wanted to test out the generic brand name brisket for you all. - First start out by getting your corned beef on the stove. Have a large stock pot or dutch oven clean and ready. In your clean sink, slice open the packaging and remove the brisket. Rinse it with cool water, and place it inside your pot or dutch oven, fat side up. You can trim the brisket if you like, but I really enjoy the fat. - Open the included spice packet and pat the spices onto the top of the brisket. Fill the pot or dutch oven with water until the brisket is covered by at least 2 inches of water. It’s alright if the spices fall off the brisket into the water. - Bring to a boil, and then turn the heat down to medium. You want there to be a gentle boil. Set a timer to 2 ½ hours. To ensure that your brisket doesn’t overboil, place 2 chopsticks under the lid to allow the pot to breathe. - The great part about it having to take 2 ½ hours to cook (I’m super inpatient), is that you have plenty of time to roast off some veggies! - Wash and peel your carrots, and give them a rough chop. Dump them in a large bowl and drizzle with extra virgin olive oil. Season with salt and pepper, and drizzle a good amount of balsamic vinegar. Use your fingers to toss them. You can also add a dash of nutmeg. 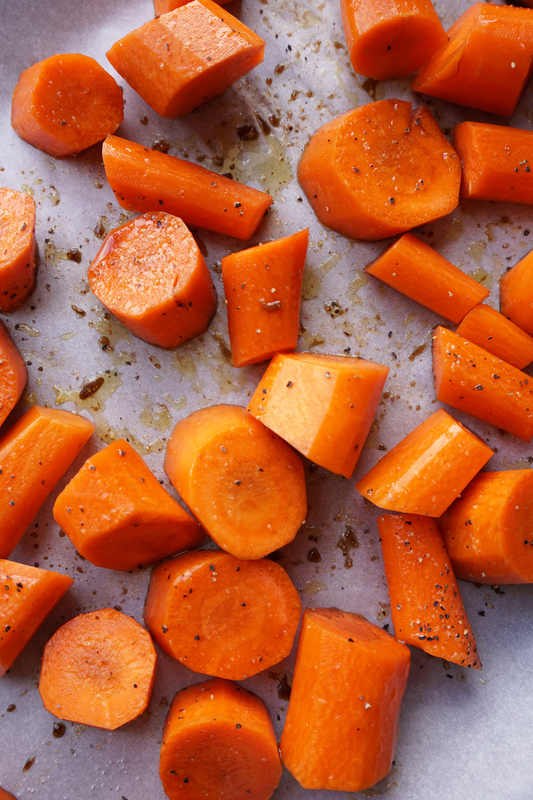 - Line a baking sheet with parchment paper and dump your carrots on it, roast them for 25 minutes. - They become so deliciously tender and their natural sweetness comes out. - As for the cabbage wedges, I have really fallen in love with the way roasted cabbage tastes. They withhold their shape and their natural flavor is really enhanced. I love peeling off layers of the roasted cabbage and rolling it around pieces of corned beef. There’s a reason why they’re served together! - Remove the outer cabbage leaf and halve the head of cabbage. Carefully remove the wedge that runs down the center of the cabbage, and then cut each halve into 4 pieces. You should end up with 8 wedges of cabbage. - You can totally use the same baking sheet as you did for the roasted carrots. Line it with parchment paper and place all 8 wedges on the pan. Drizzle with evoo, salt and pepper. - I love the layers inside a head of cabbage! Roast for 10 minutes, then carefully flip them. I found that using tongs to grab them sideways is the best method to keep them from falling apart. Season the other side and roast for 10 minutes. - Soon enough, your timer for the corned beef will go off and your kitchen will smell amazing! The corned beef should be fork tender. If you are going to serve it as is, you’re finished! Super simple. Carefully remove it from the cooking liquid with two pairs of tongs and allow it to rest for 15 minutes on a carving board. - I like to strain the spices from the cooking liquid and return them to the top of the corned beef. Your brisket will have shrunken a bunch - don’t be alarmed! - In the above pic, you can see the grain of the brisket running from right to left. When you slice corned beef it’s important to slice against the grain. - You can see that once you slice against the grain, the fibers of meat are sliced crosswise, making the meat even more fall-apart tender. Ugh, look how good it looks!! - If you’d like to bake your corned beef with a delicious Honey-Mustard glaze, place the corned beef into a baking dish. Simply combine the ¼ cup of honey, 2 tbsp Dijon, and 2 tbsp whole grain mustard and pour over the top of the corned beef, and then sprinkle 2 tbsp of light brown sugar on top. Bake for 25 minutes at 350F. - The same rules apply. Once it’s baked, let it rest for 15 minutes and slice across the grain. Glorious. - This glaze is amazing - sticky, sweet, tangy, and really perfect with the saltiness of the brisket. Easy to throw together and really helps dress up the corned beef. I found that the Safeway brand brisket wasn’t nearly as flavorful, so this glaze definitely helps out and brings the flavor to the table. - Serve your corned beef of choice with your tender roasted balsamic carrots, red potato mashers, and roasted cabbage.